Stats on Legend Packs. What's the deal?? I'm interested in hearing from you guys regarding legend claim tickets and buying card packs. Let's figure out some ratios once and for all. Please comment below on what card types you have received from your legend packs. Let's figure out whether or not this is a good investment. •3• What rarity type of cards have you have received? •4• Have you ever received a High Rare or higher rarity card? •5• If so, what was it? Was it from your claim tickets or RageMedals (ios version) aka MobaCoins (Android version)? for the upcoming quest event. If that doesn't interest you, then just answer as best as you can for no reason other to see whether or not buying these card packs are worth it. 2. about 10 or so started playing few weeks ago. 5. All from claim tickets.I play on Apple IPAD2 and Google Nexus Ice Cream OS. RageMedals just have gotten me rares. Just on a side note. I have played magic the card game and eye of judgement(card game on PS3) i have spend lots of money on cards but the ratio was good. I feel that if there a picture of Minatour on the friendship pack they should dish out high rares. If that is not the case there should be a in between pack, half the price of booster or something. I bought 2 booster packs and all I have recieved are rares. 5. My Legendary CP Tickets from the 6 were Rare. I have purchased about 8 to 10 CPs and mostly received Rares with 2 High Normal and 1 S Rare being a Tiamat. I purchased those on the Android Version. I haven't used my most recent CP but will update when I do. Side note: I've also purchased the 5 for 6 and have noticed that, my luck at least, when purchasing in succession during the rare and up campaign I received four high rares and 1 S Rare. Outside of that campaign I received at least 1 high normal per two boxes and 1 high rare per four. They do give u high rares. But it's just highly rare that u get them lol. Sorry just have a couple more questions if u don't mind. Do u remember at what level u were in the game when u received cybele and Mino? mino today when I recieved the free voucher. Cybell when I used one of my friends device to use my referel code. My other question was cut off. On the free claim ticket was it when you first started on friends phone? If so before or after boss battle? 4: I haven't gotten HR or better, but I know others have. 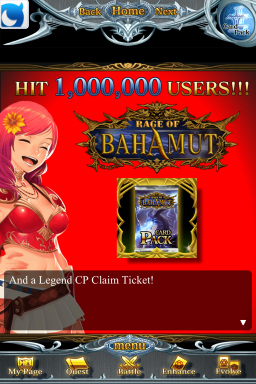 5: Regarding #4: It was on a friend's account, and it was a Legend CP Claim Ticket. Today got new demon hr with free ticket. Also was surprised today with free friendship points got 4 rares. Realm box stunk n hn 1r. •4 & 5• on my friend's phone, i got her to level 10. when i claimed her one free ticket on her iPhone, we got an HR! Mayahuel (this was the only claim ticket she received as she did not continue the game). We have been wondering the same thing as well. Hope this helps! After when you defeat the first boss. I do want to add I got axe man with silver coins I know is outside the scope of the question. 1. I purchased the new 6 for 5 Man Realm pack and received 4 rares and 2 high normals. 2. I have purchased numerous single claim tickets(much to my husband's chagrin) after my initial excitement at getting an Ifrit. 6-7 $-2.99 purchases later I am stuck with many Hnormals and a couple Rares I could have traded for anyway. My conclusion? NOT worth the money(or the relationship strife). 2. My guess is around 10. 3. High Normals (few), Rares (most), High Rares (two). I have not received a higher rarity than High Rare. 5. Sektor and Ares. Both from claim tickets. Don't count my data twice as I am Ditzsun (bizzare_me)'s friend posting. Good luck with the data compilation! •5• If so, what was it? Was it from your claim tickets or RageMedals (ios version) aka MobaCoins (Android version)? : Dancing Princess, Fairy Princess. Both Claim Tickets. 2. I believe 9. I have also bought 3 draws from Rage Medals. 4. 1 SR and 3 HR. I wish i could remember the details of which were free and which were Rage Medals. The only ones I know for sure are the Odysseus and Paladin were from free draws, and I'm almost positive the Yuki was a free draw as well. On a side note, I'm personally never spending a single penny extra on card packs. Having spent over £120 on card packs to get a miniscule amounts of rare cards, and my only HR coming from a free claim ticket, the rest all being high normal cards, I feel buying card packs is nothing short of a complete con. When spending around £16 on a 6for5 packs to get complete junk is diabolical, the minimum card you should be getting imo is a rare card. 3) Mostly HN and R's but 2 HR's. 5) Inugami and Nightmare. Both were from free claim tickets. One around lvl 40 and the other after this latest HW. I have not gotten anything higher than rare from purchased packs from android market. I'll say this. I have purchased at least ten of the 6 for 5 and never got over a high rare. I have two tiamats and they both came in my friendship pack. Then i bought three of the realm packs(15 cards) and got three hrs and the rest rares or high normal. I'm wondering if it has to do with my weird hours. Or am i just unlucky? Brough83 friend me on mobage. I have bought at least ten and had 3 3 card claim tickets and got all rares or high normal except for 4 high rares. But I've also had two tiamats from friendship packs. I have weird hours and i thought that might be why. Hrs were 2 inugami 1 sektor and a master gunner. 4. My 1 hr was Berserker. 5. Got hr from a claim tix around lvl 72. Side note: My wife and a friend used to play. They both got a claim tix at lvl 20. My wife got hr Inugami and my friend got S rare Tiamat. I may be forgetting one more, but as they were all CP, you should know the number. 2 HRs so far for sure. On friendship points, highest I got was Rare (twice in ~ 40 cards). Also another thing I'd like to point out to is, I just found out if your British or European , these card packs are costing us around 15-20% more than our US friends. of course I'd expect a a slight difference of a few pence/cents due to fluctuating exchange rates, but not such as big a difference as it currently is. I just noticed a slight error on my exchange rates, was supposed to be £1.38 per $1. Exchange rates are Always weird look at console games differences. Just bought another pack all rares. My suggestion is allow players to choose a realm pack to buy and to pay more 600 moba coins or so for high rare and up and 1000 coins for srare and up and 1500 for ssrare and up. Just my opinion though. I have never bought a ticket with MobaCoins, but many of the people in my order have, with no luck. I recieved a Tiamat during the twice the chance of pulling an SR or up out of the hat campaign. The interesting thing is, I used a claim ticket I recieved during the holy war, but instead of claiming the same day, I claimed the card after about 5. I think maybe the demand affected cards that were drawn. I also recieved a Hermes during the same campaign on a different account, but with the claim ticket you recieve once you reach level 20. I also pulled a witch commander and a lovely elf that day. 5. Cannot recall HR, but I pulled King Arthur SSR and Fairy Princess SR. All mobacoins. 2. I got 1 from beating the first boss, 1 from reaching level 20, 2 from reaching level 40 and 1 from the million campaign. 3. all rares no high rares or higher. 4. nope i'm very unlucky. 3-3 of the tickets were rares but the very first one I received was a HR Wraith, which, I've gotten a dozen offers on. I'm scared to sell her, lol. 4- Yes, the HR Wraith. Being my first card in a Legend CP, I have kept her the whole time, even though I'm a god realm. I've gotten great offers for her, and a lot of try-to-trick-a-newb offers but I don't know what I should do with her, so for now she stays with me. 5-see answers above. Came from my first claim ticket when I started the game. 2) Five free CP tickets. 3) Rares all the way from the claim tickets. Purchased cards are a different story. 4) Not from free claim tickets, no. I have received a handful of High Rares from purchased Legend Card Packs. 5) None from the freebies, but from purchased CP I've received Vampire Lord, Minotaur, Mayahuel, x2 Cybele, Dancing Princess and Master Gunner. All were purchased using RageMedals. 3) Almost all types except SSR. Best was Hermes. 5) Dancing Princess , Hermes , Nymph, Witch Commander and Mythril Golem. All from Free ones. I am looking for w.commander and m.golem. Miz, i saved all of my legendary cp tickets. Should i claim them or wait for an event? 2. About 6, just got cp claim tickets from daily bonus. •2• I've approximatly had 10 free claim tickets. •3• Most of the time, I receive rare cards but I also had high normal card and one high rare card. •5• My high rare card is Ghost rider. It's my best card for now but i'm enhancing 8 succubus to made a strong one by evolving them. •6• I don't have any IGN. 3) I have gotten mostly rares maybe one or two high rare and anythin else is lower never got sr ssr or legend cards. 4) Mosly rares got like one or two high rare. SSR Quilin (only SSR) and a couple SR. All from Free claim tickets. *I never received anything good from buying. only the free ones. Best time to purchase is when a new card set is released. start opening the second they come out. I also got mystic dancer last quest. Make sure you exchange in bulk. I got quilin from turning in 40 cp. Everything else was HR and below. But that one Quilin sold and I was able to get fox spirit and sephirot skill 10. Big jump from where I was. Now all of my cards are skill to Great boost. 100k base atk and 95 base def. Just takes a lot of luck.